Why isn’t the term ‘Self-Serve’ part of your business phone system? Today’s society has become completely self-serve. How we interact with consumer products and services has opened up into a plethora of methods, empowering the consumer. The consumer can now log-in to personal online accounts, purchase and manage services without a single phone call or visit to a store front; they can now pay for products and services from their mobile device using technologies such as NFC and Apple Pay; they can transfer funds from the comfort of their electronic devices without requiring visiting the bank, and the list goes on. This trend of empowering the consumer provides benefits to both the consumer and manufacturer. The consumer benefits from becoming more productive in their daily activities and the manufacturer benefits from selling more product and service based on this fact, as well save on support costs as the consumer have access to the same tools. So why isn’t this trend as inclusive with the telecommunication industry? For example, in a typical office environment, an employee still requires the assistance from their IT personnel for things like conference phone call setup and management, or to adjust their extension features. Another example is an employee deciding to work from home on a given day, still require IT to setup their tools and access. Or from a consumer point of view, if a business wants to purchase a cloud based phone systems or SIP trunks there is no completely automated self-serve method to do so, without waiting for a response from the provider, or requiring assistance to configure the service. Sangoma Technologies has been responding to this need in many of its products and services. Whether your business is looking to connect to SIP Trunks or require a complete fully-featured cloud based phone system, Sangoma’s SIPStation and PBXact Cloud offer a completely self-service online portal, allowing customers to immediately register, purchase and configure service, and manage features, without the need for email responses or service connection delay. Visit the following pages for information and a live demo of the entire setup process. 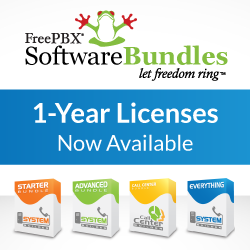 Previous PostFreePBX 15: Feedback Wanted!